As of April 12, Stephen Colbert’s portrait will no longer be at the Smithsonian’s National Portrait Gallery. Created for the final season of The Colbert Report, the show loaned the comedian’s portrait to the Smithsonian in December 2014. I was flattered to be asked to review the new Doctor Who Convention, (Re) Generation Who from March 27-29, 2015 in Hunt Valley, MD. I have been teased by friends that I am quite the “con-noisseur”, which deemed me to be perfect for this assignment. I have attended many Doctor Who Conventions over the years including all of the Chicago TARDIS conventions, most of the Gallifrey One Conventions, several Visions Conventions and even a Doctor Who convention in London and Massachusetts. (Amongst other non-Who related Cons as well). Therefore, I took my assignment very seriously. Beginning May 15, 2015, the Force returns to Disney’s Hollywood Studios as Star Wars Weekends combines the fun and adventure of the Star Wars franchise with the magic of Disney Parks. Actress Sarah Jessica Parker made an appearance at the Nordstrom store in Puerto Rico this past weekend. The store is inside the newly built ‘Mall of San Juan’, which opened its doors last week. For those of you thinking that the language barrier was an issue, think again. Parker greeted hundreds of fans as she signed autographs and thanked them for their purchases from her new shoe line ‘SJP’. Back after a 3-year hiatus, the Elite 8 Bhangra Invitational exploded back onto the scene at the GW Lisner Auditorium on February 28. The 4th iteration of this show featured local acts from the DC area and groups willing to travel from as far as Boston and New York. Studio Cosplay Inc, a community non-profit promoting the art of Cosplay, is excited to announce they will be partnering with Big Brothers Big Sisters of the National Capital Area to create a unique cosplay mentoring program. Cosplay is an art form that involves designing, creating and wearing costumes of one’s favorite superhero, TV or literary character, or self-made character. Cosplay develops such skills as project budgeting, pattern making, sewing, using light power tools, painting, and 3D printing. “Wearing a costume that you made yourself is fun for all ages and is a great way to develop self confidence in one’s appearance and abilities,” says Sabrina Maizland, V.P of Studio Cosplay. A dormant volcano, a mystical forest and an ancient prophecy… the adventure of Icarus begins when Varekai, Cirque du Soleil’s latest arena touring production, descends from the sky and into the Royal Farms Arena for seven performances only – July 8-12, 2015! The 9:30 Club was packed full on Sunday night to see the Queens in all of their delicious glory. This was a fantastic show. 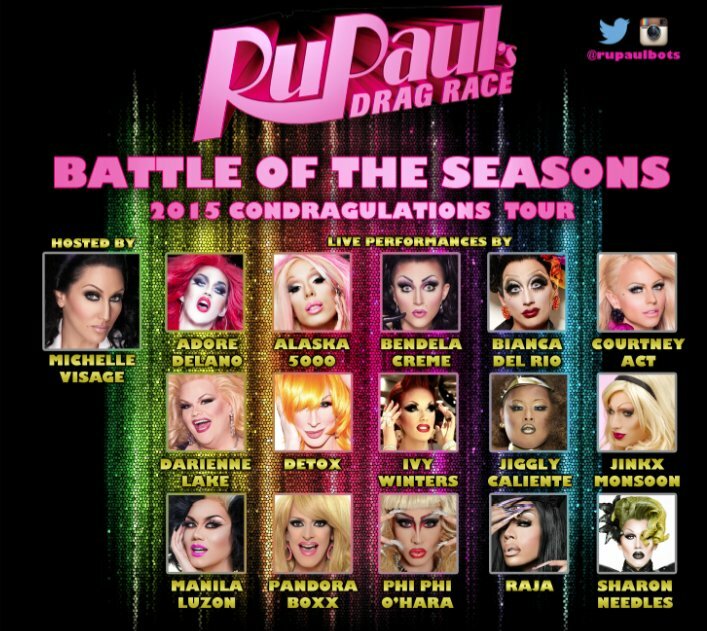 RuPaul’s Drag Race is coming to the Nation’s Capital this weekend at the 9:30 Club. Tickets can be purchased here.